It’s basically like Wild Wild West (you know, as in the Will Smith and Kevin Kline flick). Imagine the age of steam on the wild frontier. You are invited to explore with us the world of roughriders on mechanical horses, mad inventors, mystical Indian shamans, and mighty steam locomotives. Picture airships instead of stagecoaches, and the precision of robotic sharp shooters. 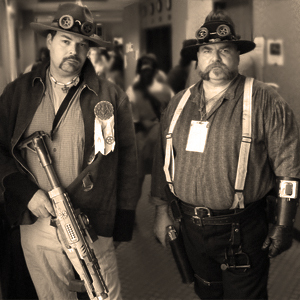 If western steampunk doesn’t appeal, there will still be lots of classic steampunk to partake of as well. Steamcon II is being held November 19 – 21, 2010 at the Hilton Seattle Airport Hotel and the Seattle Airport Marriott in Seattle, Washington. Guests of honor include writer James Blaylock, artist Jake Von Slatt, game developer Shane Hensley. On-line sales of memberships will end on October 29th. Single-day tickets will be available at the door. They will cost $30 for the day. Visit www.steamcon.org for more information, and to buy tickets! I miss Brisco County, Jr.